Not long ago, in April 2017, I was in charge of an event called The Catastrophic Meal. 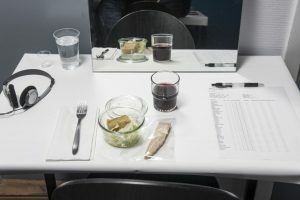 It was a one-off meal in which six servings and snacks were served to reflect different possible scenarios for food and meals in 2067. Three of the servings showed dystopian futures; and the other three, utopian. The guests moved from one serving to the other, and with each dish they entered a new scenography. The three dystopian scenarios were fun but scary to work with. In the first of them the privileged ate while watched by a herd of refugees: homeless, hungry humans. This scenario reflected the human migrations already happening and to come, due to war, climate change, lack of water and food. These refugees migrate towards wealth, peace and food, and have the potential to bring instability with them. I am far from wanting to close borders to people in need, but it is clear that governments need to think about ways to integrate these migrants so that they bring positivity to their countries in the shape of cultural wealth, diversity, and a contribution to the workforce, rather than political fragility, fear, rejection and racism. The second dystopian scenario was about loneliness, and though an exaggeration of modern society, it was but a short step from the current effects of technologies and social networks. In this scenario people ate alone at a small table, in front of a mirror and with listening to podcasts about diets and allergies through earphones. The mirror was an allegory of the narcissism of social networks, how the screen is often part of our meal-times. The third scenario, finally, concerned the environment and the loss of biodiversity. It was a world in which ‘the natural’ didn’t really exist anymore. The taste is fake, the meat is fake, the soil is lost, and so everything is laboratory-made. These three dystopian scenarios were extremely sad and powerful in telling the guests where we might be heading both as a society and as individuals, making decisions focused on the short-term, and for the benefit of the privileged and our own ego. The three utopian scenarios, in contrast, were about community, respecting traditions and biodiversity, multiculturalism, conversation, engagement and simplicity. These values were reflected both in the setting and in the food itself. None of our chefs went for modern gastronomical technologies or fancy ingredients – quite the opposite, their food was cooked under or over a fire (or the equivalent using an oven); they went for heirloom varieties, local produces, wild herbs that are considered weeds. They used what was available in April in Denmark and made it delicious. In these scenarios, without even thinking about it, the chefs were there, sharing the moment with the guests, and not in a remote and invisible kitchen. They were visibly part of the community in which the meal took place. In a well-defended theory, Richard Wrangham suggest that the origins of humanity lie in our use of fire to cook. From this point in time, food became more nutritious, changing the pre-human body to what it is today: bigger brain, smaller belly, and so on. He also suggests that everything else we consider typically human comes from the action of cooking: tools, division of tasks, language, cooperation, culture. We both learnt to cook and developed as human beings over the course of about two millions of years. Since the end of World War II, we observe a constant decline in cooking, especially in occidental countries. This change of paradigm is so strong that in two generations we have lost much of our knowledge of cooking. Things that our ancestors were doing on a yearly or quotidian basis for thousands of years are now forgotten. Very few of the newer generation still know how to bake a good sourdough bread, kill a pig and utilize all its parts, make preserves, jams, and so on. Our grand-parents (or great-grand-parents) had a basic knowledge of which wild plants were edible and which ones were poisonous: knowledge that my generation rarely has. We are constantly being reminded that biodiversity and the resilience of the planet is at stake because of it. But less considered is the loss of basic knowledge about feeding ourselves, and the way this is putting in danger our resilience as human beings. Beside this loss of knowledge, is the loss of respect for the Meal. Sharing a meal a necessity for the early humans was, as the tasks required in making it were so diverse that they couldn’t cook as lonely individuals. It has been thus through the history of humanity: some would provide the meat/the money (generally the men), some would cook (generally the women), and they would share. Sharing a meal is recognizing that each member around the table has been active in helping make it, is the celebration of a synergy. Having a guest is allowing someone to enter this intimate circle of interdependency. It is the ultimate gesture of inclusion, a communal act of generosity. We gained independence, we lost interdependency. There is no more synergy. In this context, respecting the meal becomes a human vocation as much as an ecological obligation. So what is a utopian feast? A utopian feast starts in the living kingdom, the natural world: the animal, the forest, the garden. It gets the ingredients from where they grow and transforms them with conscious attention. Such a feast doesn’t have to be vegetarian or vegan, it has to be aware and grateful of the lives sacrificed for the feast. It has to make sure that these animals were respected in their lives, by giving them a proper and good environment; and in their death, by transforming all of their body into delicious dishes. A utopian feast has the taste of nutritious ingredients coming from a healthy soil and grown under the sun. It is also a meal that doesn’t glorify one eccentric chef, but rather nature’s generosity and biodiversity; and celebrates the many humans that have brought these elements of nature together. The utopian feast is not necessarily fancy; it is a meal shared with the many cooks, with the farmers and producers, with the neighbors and the newcomers. It is a meal whose making has engaged as many of its guests as possible in the many and diverse tasks which it requires: such that naming them all would be to describe civilisation. To paraphrase Michael Symons, civilisation is a culinary creation; and as says Richard Wrangham, cooking made us human. What is an utopian feast? It is a feast that celebrates our humanity by transforming nature into culture through respect and simplicity, the sharing of food, tasks, culture and conversations. Justine de Valicourt is a Chef and Scientist. She was until recently a teacher of cooking, baking, sciences and permaculture at Vestjyllands Højskole in Denmark, and is now pursuing a career in regenerative farming and cooking, and the freelance teaching of these subjects, in Québec, Canada. Justine has also worked at the Nordic Food Lab; the Fundacio Alicia; and the three Michelin star rated El Celler de Can Roca, which has twice been named ‘best restaurant in the world’ by the magazine Restaurant.